Japan has summoned China's ambassador to protest against the appearance of Chinese patrol boats near a disputed chain of islands in the East China Sea. Three Chinese fishery patrol boats entered the area early on Wednesday and have since left, reports say. The Japanese and Chinese foreign ministers are due to hold talks on the sidelines of the Asean forum in Cambodia over the islands. The uninhabited islands have been a longstanding source of tension. Known as Senkaku in Japan and Diaoyu in China, the resource-rich islands are controlled by Japan, but also claimed by China and Taiwan. "It is clear that the Senkaku islands are inherently Japanese territory from a historical point of view and in terms of international law," Japan's chief cabinet secretary Osamu Fujimura told reporters. 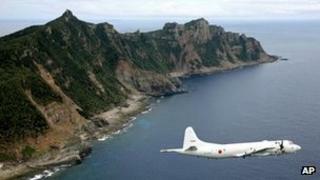 The crews of the three Chinese vessels initially refused to leave the area, said the Japanese coast guard. However, China said that the boats were carrying out a ''fishery protection mission'' in the area, in a report by the official Xinhua news agency. Tensions have been rising after Japan's bid to nationalise the disputed islands, says the BBC's Mariko Oi in Tokyo. A fresh row erupted when Prime Minister Yoshihiko Noda said on Saturday that his government is negotiating to buy the islands in response to a similar plan initiated by Tokyo's governor Shintaro Ishihara in April. This drew angry responses in China media and Beijing. "China's holy territory is not 'up for sale' to anyone," said China's Foreign Ministry spokesman Liu Weimin. At the meeting between the foreign ministers, both sides are expected to discuss the islands, which lie northeast of Taiwan, east of the Chinese mainland and southwest of Japan's southern-most prefecture, Okinawa. Relations between China and Japan hit a low point after Japanese coast guards arrested a fishing boat captain near the islands in September 2010 following a collision.